Greenland, the world’s largest island, is one big ice sheet surrounded by a narrow, mountainous, barren, rocky coast. Its 57,695 residents are a hardy bunch. They have to be; Greenland is a harsh place in which to live. But global warming is changing the world, and there may be a new sense of what is normal in Greenland. 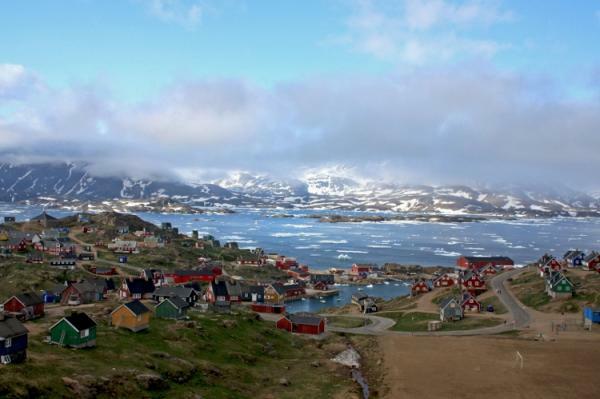 While warmer weather is threatening the traditional way of living, life for the Greenlanders is also improving – controversial though this may sound. Greenland is a major player in the climate change debate. The gigantic ice sheet that covers it is melting at a rate of over 200 cubic kilometers (125 mi) per year and has retreated a total of 80 kilometers (50 mi) so far. While this raises the sea level for much of the world, it is also exposing once buried treasures. Mining companies are moving in, searching for gold, copper, iron and diamonds. The melting ice has also made it easier to go after the estimated 48 billion barrels of oil reserves that lie off the coast.